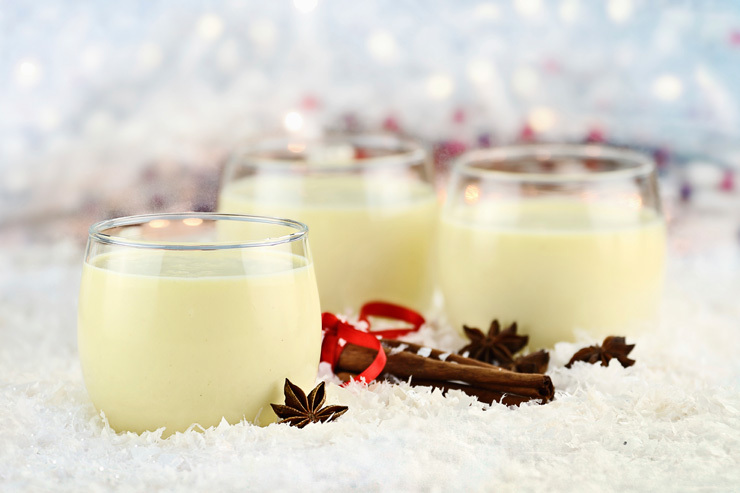 Do you love drinking eggnog during the holidays? This year, instead of buying your eggnog, try making your own! This recipe is so delicious and easy to make, you’ll never want to drink store bought eggnog again! Separate the yolks from the whites. Place the yolks in a large mixing bowl and leave the whites aside. Beat the yolks on medium speed using an electric mixer until they lighten in color slightly. Slowly add the sugar while beating, until the yolks and the sugar are well combined. The sugar should be completely dissolved into the yolks. Slowly add the milk, heavy cream, bourbon, and nutmeg and stir until well combined. If you like your eggnog a little stronger, add another ounce or two of bourbon. Set aside. Add the milk, heavy cream, and nutmeg to a medium saucepan and bring to a boil. Stir constantly to prevent the milk and cream from sticking to the bottom of the saucepan. Remove from the heat and slowly add the warm milk to the egg yolk mixture, whisking vigorously. Make sure you add the warm milk mixture as slow as you possibly can, otherwise the yolks will begin to cook. Transfer mixture back to the saucepan and heat on medium until a candy thermometer reads 160 Degrees Fahrenheit. Remove the saucepan from the heat and stir in the bourbon. Pour into a mixing bowl, cover, and store in the refrigerator until completely chilled. Add egg whites to another mixing bowl. Beat on high speed until soft peaks form. Set the mixture on high speed and add the remaining granulated sugar until well combined. Keep mixing until stiff peaks form. Whisk the egg whites into the eggnog mixture. Cover the bowl well with plastic wrap and chill for at least a few hours before serving. Serve each portion with extra bourbon, if desired and a dollop of whipped cream. Eggnog with Spiced Rum. Follow the recipe listed above. Use spiced rum instead of bourbon. Chocolate Eggnog. Follow the recipe listed above. Whisk in ¼ cup chocolate sauce just before adding the egg whites. Cinnamon Eggnog. If you like cinnamon better than nutmeg, you’ll love this version! Just substitute the ground nutmeg for ground cinnamon. Chai Eggnog. Prepare the eggnog as listed above. Whisk in ½ cup prepared chai tea before whisking in the egg white mixture. Cappuccino Eggnog. Substitute the bourbon for coffee liqueur. Whisk in ½ cup espresso before whisking in the egg white mixture.